Last week, I was in Köln, Koeln, Keulen or Cologne (depending on from which country you are) with my family and while on our way to the Dom, Cologne’s well-known cathedral, I bumped into one of the greatest heroes of electric circuit theory: Georg Simon Ohm. 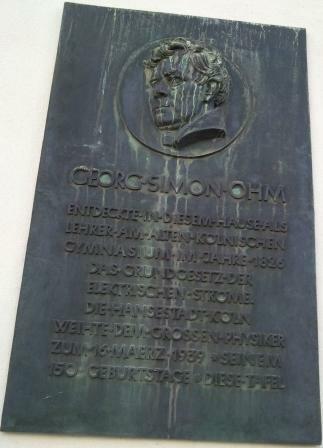 The sign says that "George Simon Ohm discovered, in this house, being a teacher at the Old Gymnasium in Cologne, in 1826, the foundation of electric current." Though one of the most important discoveries indeed, I think it is not so much the discovery of the foundation of electric current, but rather the relation between voltage and current that holds for linear resistances (and impedances, in the harmonic regime), later known as "Ohm’s Law" that caused his name to be remembered forever. For those that have both an interest in technology and law, I cordially recommend Ohm’s Law and Kirchhoff’s Laws as basic study material. This entry was posted in education, electronics, general. Bookmark the permalink.